The Millennium Stadium is Cardiff's most famous landmark by some distance. During its relatively short 13-year existence, it has achieved iconic status and is recognisable to most sports fans around the world. The magnificent 74,500 seat, sliding-roof stadium was completed in 1999 at a total cost of £126 million. It was built to provide a new home for Welsh rugby and football internationals, and of course to host the Rugby World Cup 1999. The stadium got off to a flying start on 26th June 1999, when Wales beat South Africa in a rugby international. This was not only the first match to be staged at the new stadium, but it was also the first time Wales had ever beaten South Africa in rugby! In addition to hosting the Rugby World Cup 1999, the stadium also hosted matches during the 2007 tournament, and will again be used during the 2015 tournament. With the reconstruction of Wembley taking place between 2001 and 2006, the Millennium Stadium was used as a temporary home for matches that would normally have been played at Wembley. Matches such as the FA Cup Final, the League Cup Final, the Football League Play-off Finals and the Challenge Cup Final all came to Cardiff during this period. The Millennium Stadium is also used to host music concerts. It has attracted many big acts to Cardiff, including U2, The Red Hot Chilli Peppers, Robbie Williams, Take That, The Rolling Stones, REM, The Police, Madonna and Paul McCartney to name a few. The chart-topping boy band One Direction will perform two huge concerts at the Millennium Stadium during the summer of 2015. The Millennium Stadium was an official London 2012 Olympic venue, and was used to host some of the matches in the Olympic football competition. Other events that have been held at the Millennium Stadium include: Speedway, World Rally Stages, Monster Truck Racing and even an indoor cricket match. In 2007, local boxer Joe Calzaghe was cheered on by 50,000 fans to become the undisputed world super-middleweight boxing champion, when he beat Mikkel Kessler at the stadium. For us Welsh, the most memorable events that have occurred at the Millennium Stadium are rugby related. In 2005 Wales won the Six Nations Grand Slam by beating Ireland 32-20 on the final day of the championship. Wales then went on to win another Grand Slam in 2008 by beating France 29-12 in another epic final day encounter. A third Grand Slam in the space of 8 years came in 2012 when Wales beat France 16-9. Visitors who are eager to explore the stadium (on a non-matchday) can book a tour. Stadium tours offer visitors the opportunity to see areas that are normally restricted, such as the players changing rooms, training areas, medical rooms and the Royal Box where the Queen watched the Rugby World Cup Final. Regular tours depart daily and cost £6.50 for adults and £4.00 for children (see full details of prices below). By car: Exit the M4 at Junction 32 and follow signs to Cardiff city centre. The cheapest parking on match days is usually to be found in Sophia Gardens, which is a 10-15 minute walk from the stadium (depending on which gate your require). Alternatively, NCP car parks are located throughout the city centre, but they are generally more expensive. 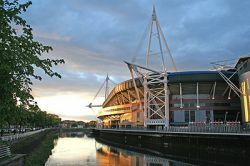 By bus & train: The Millennium Stadium is located opposite Cardiff central train and bus stations. Simply exit the stations (to the front) and the stadium should be visible in front of you.